An Indoor Twist on our Spring Yard Sale!! 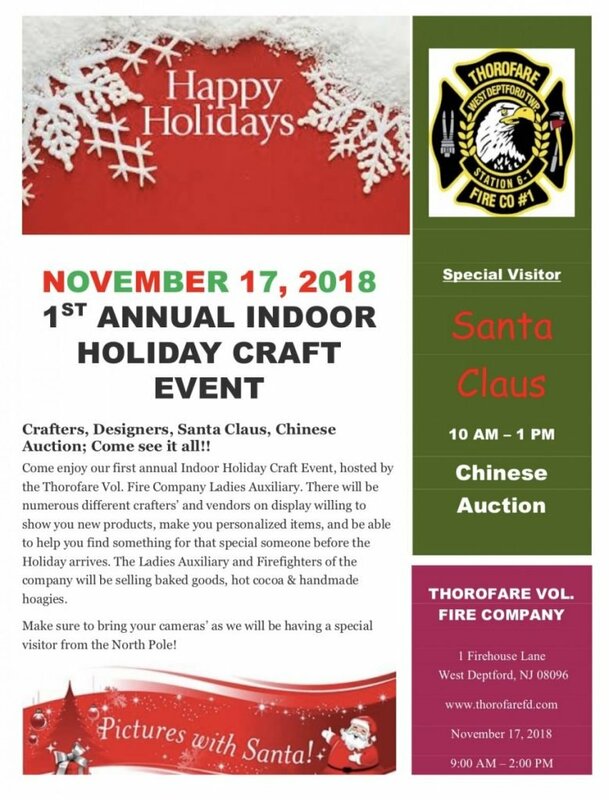 Our First Annual Indoor Holiday Craft Event fund raiser for the Thorofare Volunteer Fire Company Ladies Auxiliary will be Saturday November 17, 2018 9am-2pm. Crafters, Designers, Santa Claus, Chinese Auction; Come see it all!! There will be numerous different crafters’ and vendors on display willing to show you new products, make you personalized items, and be able to help you find something for that special someone before the Holiday arrives. The Ladies Auxiliary and Firefighters of the company will be selling baked goods, hot cocoa & handmade hoagies. Any vendors or crafters interested in selling their items at this event. Contact us today. A registration form has been created and is available Here! Registration deadline is November 3rd. Fill out the form and follow the directions on the form to submit to the committee. All Money Due with application. Please share this event to spread the word! The event will take place in the Thorofare Fire Hall.